Two of the most important things you'll do in any Pokémon game is battling and catching Pokémon. Here's how to do exactly that. A Pokémon battle is a form of competition between Pokémon. In these battles, you either fight against a Pokémon you encountered in the wild, or against Pokémon owned and trained by a person – its Pokémon Trainer. When fighting a wild Pokémon, the battle ends as soon as it faints. In a Trainer battle, the Trainer may send out another to take its place, drawn from their party. After all of either side's Pokémon have been defeated, the battle is over, and the loser must pay out some amount of money to the winner, determined based on the level of the Pokémon and type of Trainer defeated. If your Pokémon have all been defeated, you will black out, and be teleported back to the most recent Pokémon Center you have visited (or to your home, if a Pokémon Center has not yet been visited). 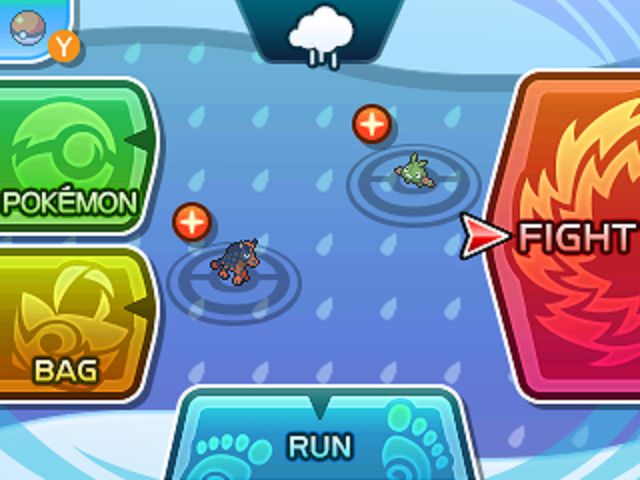 The main battle screen has four options: Fight, Bag, Pokémon, and Run. Depending on which of these is selected, a different menu will appear, or the battle may end. These same four options will appear no matter what kind of battle you are in, be it with a wild Pokémon, an NPC, or another player via link battle. Battles are conducted in a turn-based manner. The Pokémon to take action first is determined by the priority of their action, then the Speed of the Pokémon. Selecting Fight will bring up another menu which allows you to choose which of your Pokémon's current moves is to be used during the turn. Depending on its remaining PP, a move may or may not be able to be selected; at least 1 PP is required to select the move. Once both sides have selected the move they will use, the Pokémon currently in battle will make each of their moves in turn, with the Pokémon with the highest Speed stat going first, and the one with the lowest Speed stat going last. Depending on the moves used, items held by individual Pokémon, and status conditions, this progression may be altered. As each Pokémon makes its move, a Pokémon may faint if its HP reaches 0. If this occurs, another Pokémon must be switched in to replace it in battle for the battle to continue. If Bag is selected, it will bring up the contents of your Bag on screen. The games feature a separate Bag menu for in-battle use that categorizes the items that you have depending on their use. If an item is selected to be used, this will take place before any Pokémon makes its move, and your Pokémon will not be able to make a move. The Bag selection is sometimes disabled, most notably in link battles and during Battle Royal and Battle Tree competitions. Selecting Pokémon will bring up a menu of your current party Pokémon, allowing them to be checked or switched into battle, which will send your active Pokémon back into its Poké Ball. As with the Bag, the Pokémon menu screen is different from the overworld screen, featuring only battle-relevant data. If Run is selected, you will attempt to escape from the battle. Battles against NPC Trainers cannot be run from. This option, like Fight, also depends on the Speed of the Pokémon in battle, with a calculation made based on the two resulting in either you escaping a wild battle (if your Pokémon's Speed is high enough) or being stuck in battle and losing a turn. Trapping moves can prevent escape attempts from being made, as can your own Pokémon if it has previously used Ingrain. A Double Battle is initiated when two Pokémon, rather than one, are sent out per side. Double Battles can alter a player's strategy a lot, now having to evade twice the moves and make twice the decisions per turn. Several moves change when used in Double Battles. While most will target one of the two Pokémon, selectable after the move itself is chosen, some moves target both opponent Pokémon, both opponents and its partner, the user and its partner, or all Pokémon in the battle. Some Abilities may have an effect in Double Battles, while being useless in Single Battles. Moves that target multiple Pokémon resolve in order of the Pokémon's respective Speed stats. Pokémon are also switched in to replace KO'd Pokémon at the end of a round of combat. It is possible for a Pokémon's move to fail due to a lack of target if both of the opposing Pokémon are knocked out before it attacks. Some specific Trainers will automatically engage you in Double Battles. A Multi Battle is a type of Double Battle in which each of the four Pokémon is controlled by a separate Pokémon Trainer. Aside from the fact that Pokémon on the same side are controlled by different Trainers, Multi Battles act the same as normal Double Battles. Multi Battles occur when you team up with another Trainer. If you team up with another Trainer as part of the storyline, your Pokémon total, as well as that of their opponents, may exceed the limit of six Pokémon per team imposed by party restrictions for other types of Pokémon battle. An SOS Battle is a new type of battle introduced in Pokémon Sun and Moon. In this kind of battle a wild Pokémon calls for help from allies, turning a normal one-on-one wild battle into a two-on-one battle. Once you clear the first trial with Ilima at Verdant Cavern, battles with wild Pokémon can turn into SOS Battles. A Battle Royal is another new type of battle introduced in Pokémon Sun and Moon. Battle Royals are held at the Battle Royal Dome, and involve four Trainers all battling each other at the same time. Each Trainer brings up to three Pokémon into the ring, using one Pokémon at a time. At the end of a turn, if a Trainer has no Pokémon left, the Battle Royal ends. As with Double Battles, some moves are able to hit multiple opponents in a Battle Royal. Caught Pokémon are Pokémon that have been put in the control of a Pokémon Trainer by the use of a Poké Ball, or by trading with another Trainer. The catching process typically involves a battle in which the Pokémon is at first weakened and/or affected with a status condition, at which point you throw a Poké Ball (or upgraded version) at said Pokémon (selected from the Bag option, or by pressing Ⓨ in battle) in order to catch it. Catching Pokémon is central to the Pokémon franchise; a caught Pokémon can be used in battling to aid Trainers, whereas Pokémon in the wild cannot. Pokémon that you caught yourself will always obey you in battle. However, if you got a high level Pokémon from a trade and have not completed the required Grand Trial, it may disobey and refuse to execute a move during battles until the requisite Trial is completed. Caught Pokémon are stronger than Pokémon in the wild. At the same level, a caught Pokémon will have more points in every statistic than a wild one. This is due to the fact that caught Pokémon gain EVs from every battle they partake in, and therefore, by training, will gain points in their stats based on what they've encountered. This becomes more and more obvious at the later stages of the game, where the higher levels allow for a greater disparity of stats between caught and wild Pokémon, especially those raised from a low level, giving the Trainer a more decisive edge in wild battles. It's important to note, however, that Pokémon controlled by other Trainers are just as strong statistically (at the same level) as yours are. Newly caught Pokémon are no stronger or weaker than their wild counterparts, with the exception of innate IV differences. Caught Pokémon can level up, learn new moves in battle and can evolve, while wild Pokémon cannot. By using some Poké Ball varieties, such as the Luxury Ball and Friend Ball, a Pokémon's friendship may be higher than usual upon being caught. Pokémon are caught in Poké Balls. There are different kinds of Poké Balls, all differing from each other in some effect, whether it be an increased ability to catch a Pokémon from the wild or an effect which occurs only after the Pokémon has been caught. Each variety of the Poké Ball has a unique animation when they open to draw in a Pokémon and when a Pokémon is sent out, and the type of Poké Ball used to catch the Pokémon is preserved on its status screen – even after trading.